The two had worked together in construction since he was 16. “It’s been bitter, but I don’t know what my feelings are,” he said. “I’m not angry so much as I just don’t understand it. My wife’s in shock.” He said his daughter would fly to Barcelona to help make arrangements. Jared Tucker had three teenage daughters. 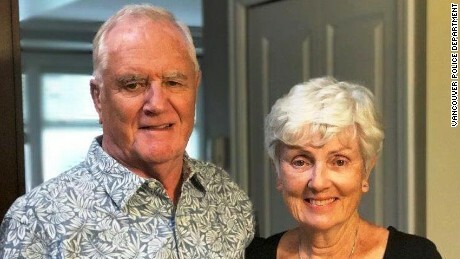 Canadian Ian Moore Wilson was traveling with his wife when he was killed in Barcelona. She was hurt. One Canadian was killed and four were hurt in the Barcelona attack, Canadian Prime Minister Justin Trudeau said in a statement Friday. 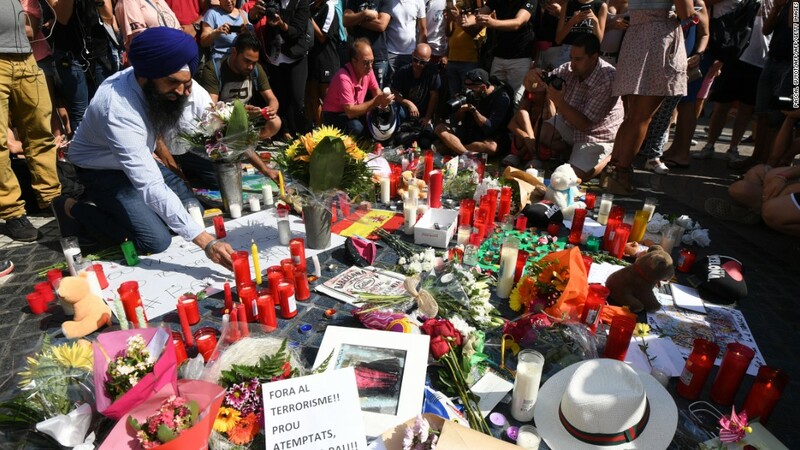 “We join Spain and countries around the world in grieving the senseless loss of so many innocent people,” Trudeau said. An officer with the Vancouver Police Department said her father, Ian Moore Wilson, died while traveling with his wife, who was injured in the attack. “He was compassionate, generous, adventurous and always game for a lively debate, a good book, exploring new places, and a proper-sized pint,” Staff Sgt. Fiona Wilson said. Her parents had been together for 53 years, she said. The identities of the three injured have not been released. 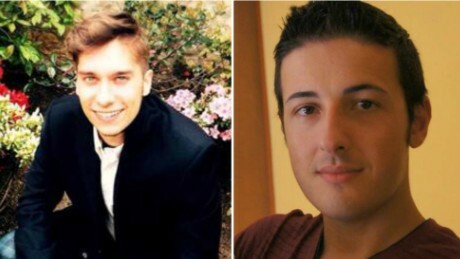 Luca Russo, left, and Bruno Gulotta were among the Italians who died in the Barcelona attack. 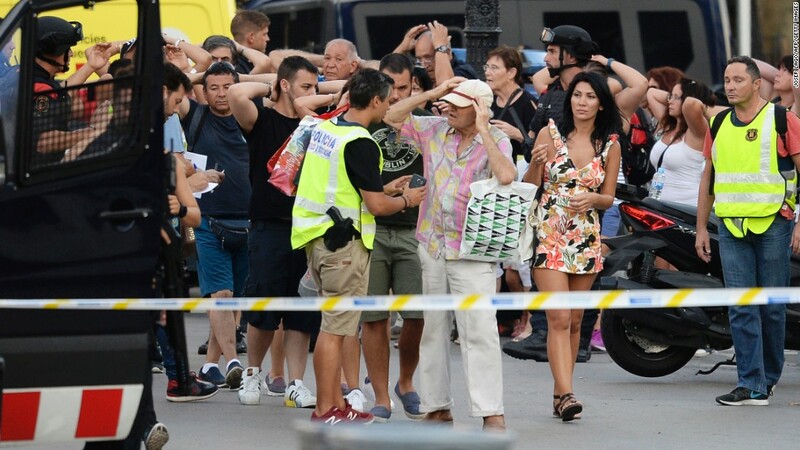 Bruno Gulotta, a father of two, , 25, and Carmen Lopardo, 80, were among those killed in Barcelona when a vehicle mowed down crowds on Las Ramblas, a pedestrian thoroughfare in the heart of the city. Gulotta was on vacation with his partner, Martina, and two children, son Alessandro, 5, and daughter Aria, who is a few months old, according to his employer. 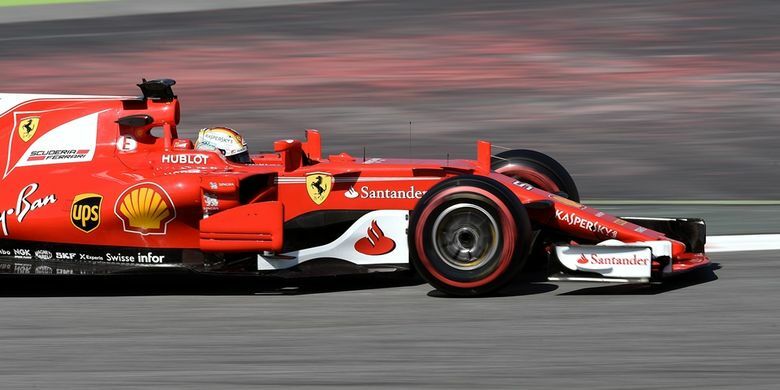 Russo was an engineer on vacation with his girlfriend, Marta Scomazzon. The pair were both first aid assistance volunteers, and the Green Cross Civil Protection Association in the northern Italian town of Bassano del Grappa told CNN that Scomazzon was among the 120 injured in Barcelona. Lopardo was visiting Barcelona from Buenos Aires, where she had lived for 60 years while retaining her Italian citizenship, an Italian Foreign Ministry statement said. A 74-year-old Portuguese woman from Lisbon and her 20-year-old granddaughter have also been confirmed dead, Portuguese Prime Minister António Costa said. They have not yet been named. “They arrived, got settled, made contact with their family and went for a short walk. 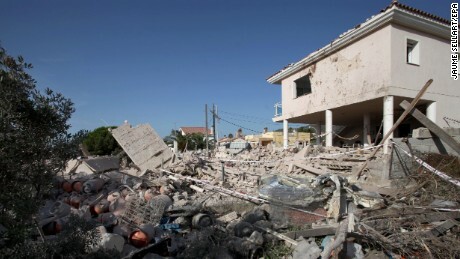 And they were swept away in this tragic incident,” said José Luís Carneiro, the secretary of state for Portuguese communities, according to his spokeswoman. The grandmother had planned to celebrate her birthday in the coming days, the spokeswoman said. A Belgian has also been confirmed dead. The emergency services in Catalonia said Friday that 24 doctors had worked through the night conducting autopsies. 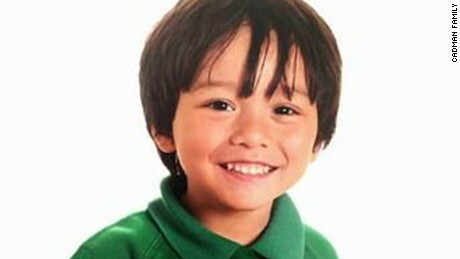 Julian Cadman, 7, an Australian-British boy, has been reported missing by his family. Family members of a 7-year-old Australian-British boy have reported him missing in the aftermath of the Barcelona attack, an advocacy association for missing children said Friday. 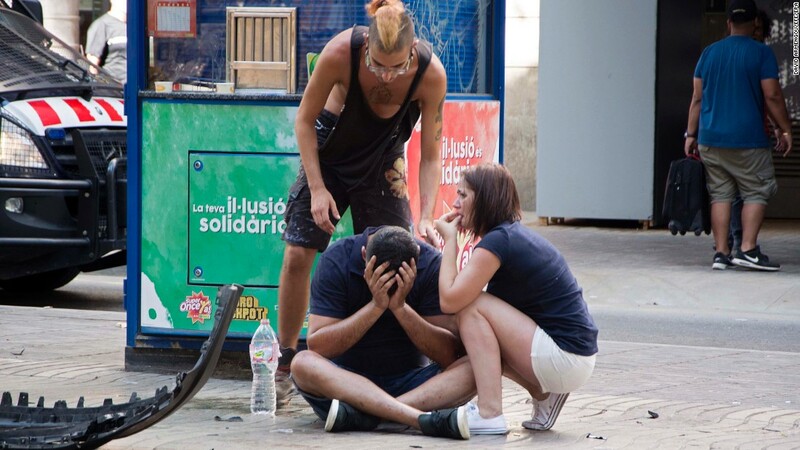 Julian Cadman was with his mother on Las Ramblas when the van plowed through the crowds, Francisco Jimenez, coordinator of SOS Desaparecidos, told CNN. The boy’s mother was injured in the attack and taken to a hospital, where she told hospital workers before losing consciousness that her son had been with her, Jimenez said. Julian’s grandfather, who lives in Spain, reported him missing to the association as well. It distributed a missing child alert because his name wasn’t on the lists of those injured or killed in the attack, Jimenez said. His father is en route from Australia to Spain, Jimenez said. A makeshift memorial pays tribute to those who were killed in a terror attack in Barcelona, Spain, on Thursday, August 17. 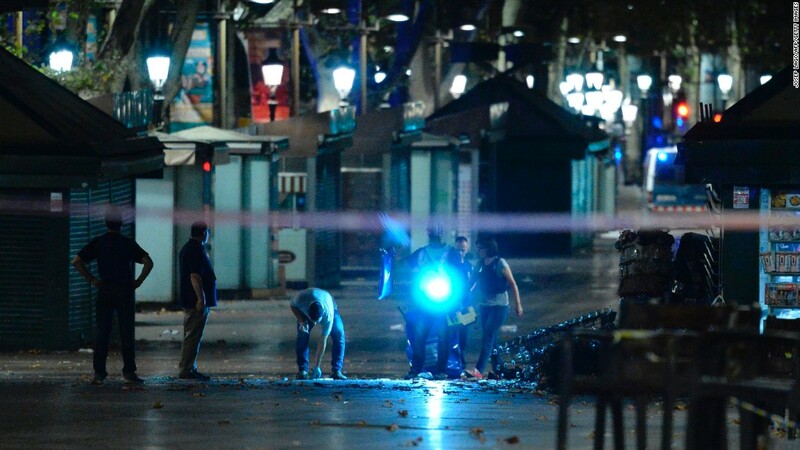 A van rammed into a crowd of people near the popular tourist area of Las Ramblas. 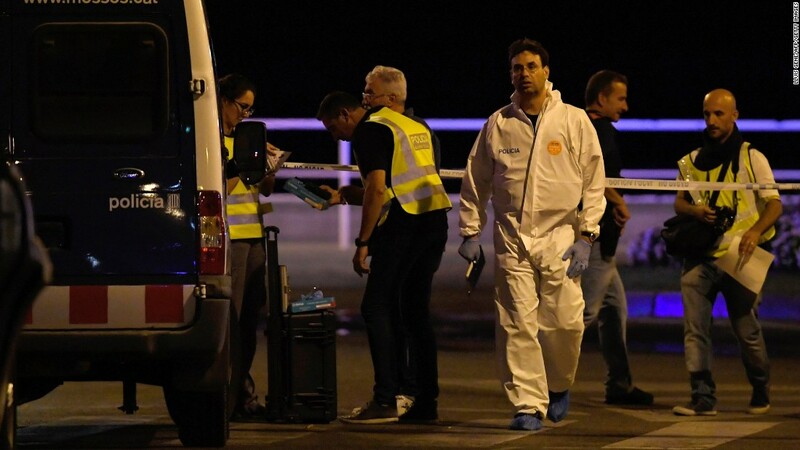 Early the next morning, a group of five attackers drove into pedestrians in the Spanish town of Cambrils, about 75 miles south of Barcelona. 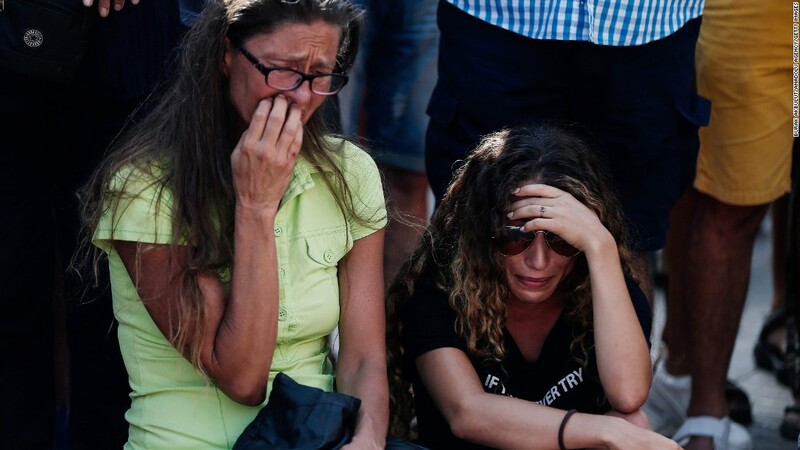 Two women cry at the street memorial in Barcelona on Friday, August 18. 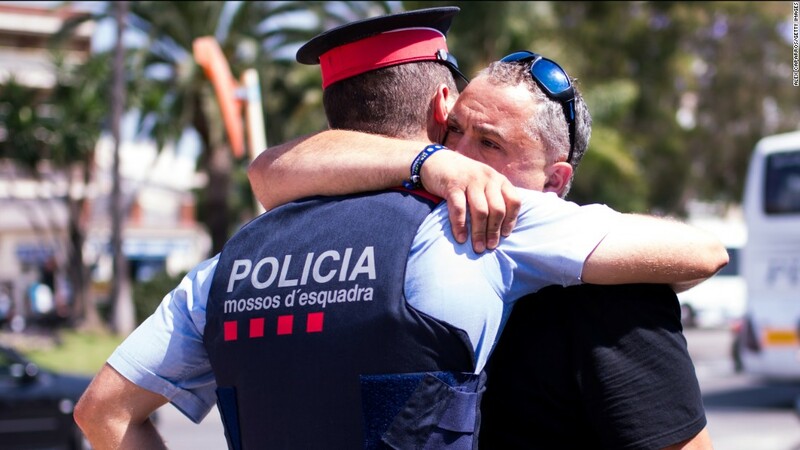 A man embraces a police officer in Cambrils on August 18. Earlier in the day, officers had engaged in a shootout with five attackers who drove a car into several pedestrians. All five were shot dead by police, four of them by one officer, police said. 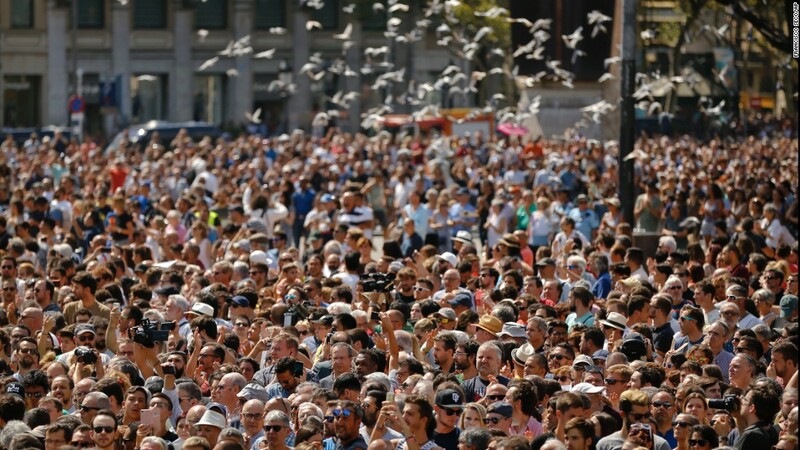 Pigeons fly over a Barcelona crowd that gathered for a minute of silence on August 18. 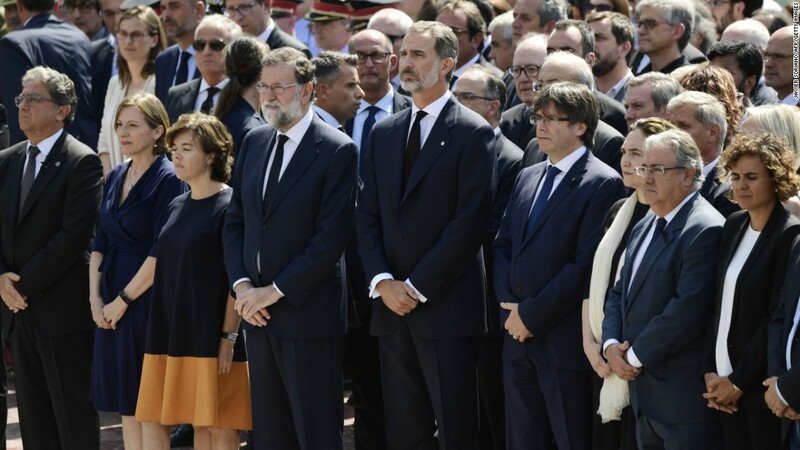 Spain’s King Felipe VI joins other officials in observing a minute of silence in Barcelona’s Plaça de Catalunya. 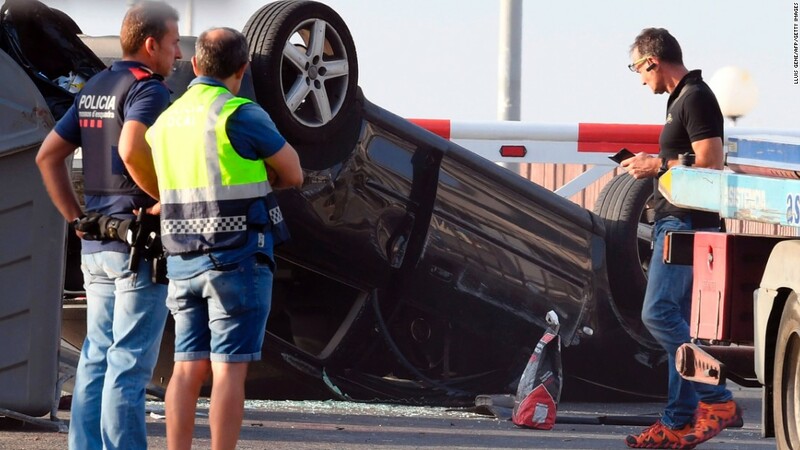 Police officers investigate a car in Cambrils. 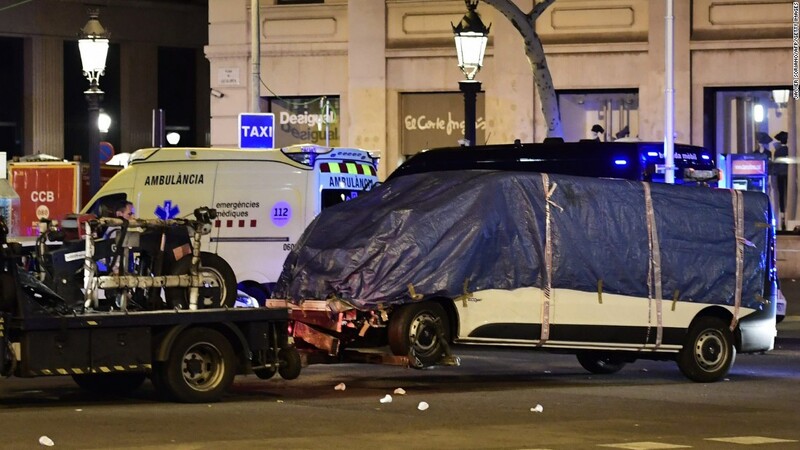 The van that plowed into the crowd in Barcelona is towed away from Las Ramblas on August 18. Police officers check the area after towing away the van. 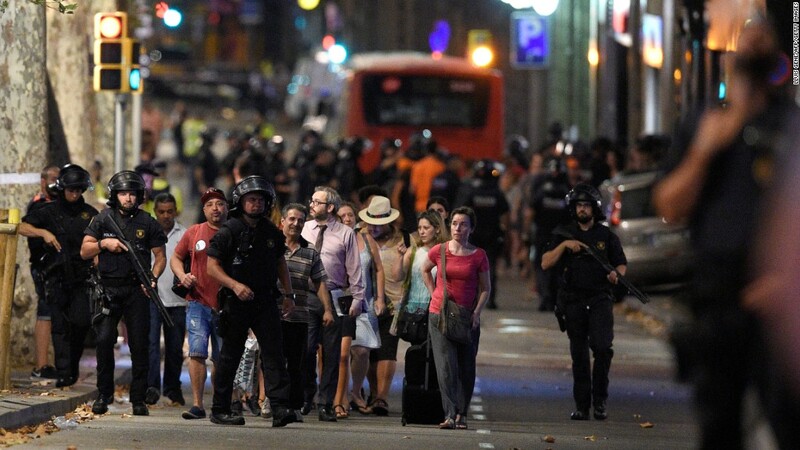 Police accompany clients of a store outside a cordoned off-area of Barcelona. Las Ramblas is especially crowded in the summer, the height of tourist season. The promenade passes by kiosks, flower sellers, cafes and bars. Police officers work at the scene in Cambrils. 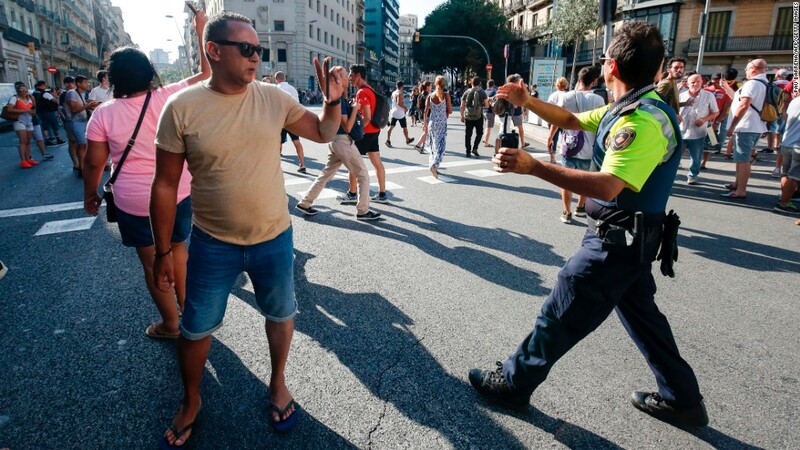 Police check people’s identities as they clear Las Ramblas on August 17. People evacuate an area of Barcelona on August 17. 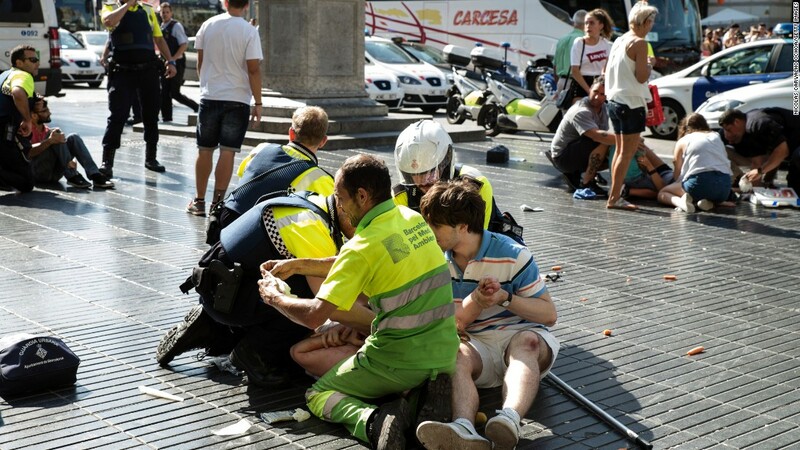 Medics and police tend to injured people near the scene of the attack in Barcelona. 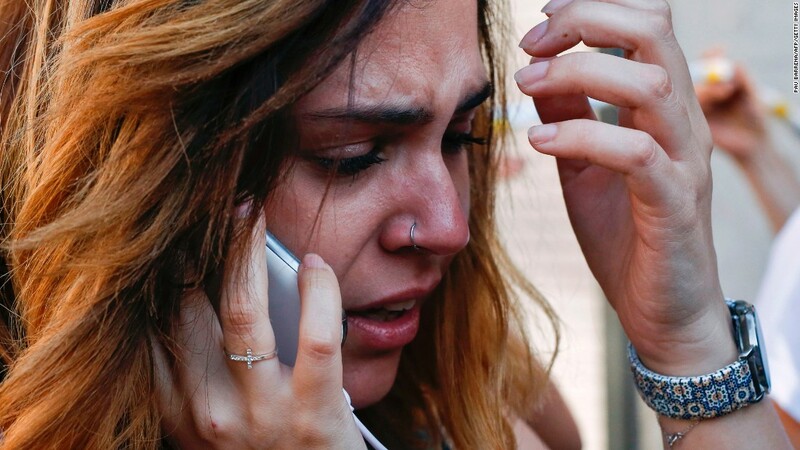 A woman cries as she speaks on her phone in Barcelona on August 17. 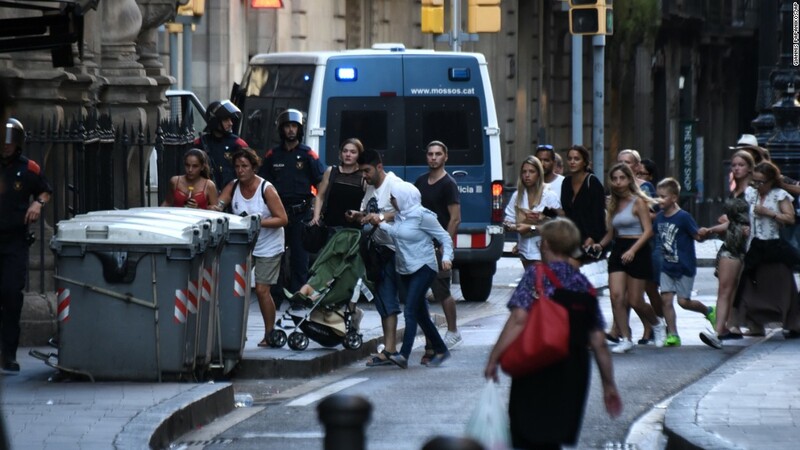 People react after the incident in Barcelona. A police officer asks people to move back in Barcelona. An injured person is carried by police in Barcelona. 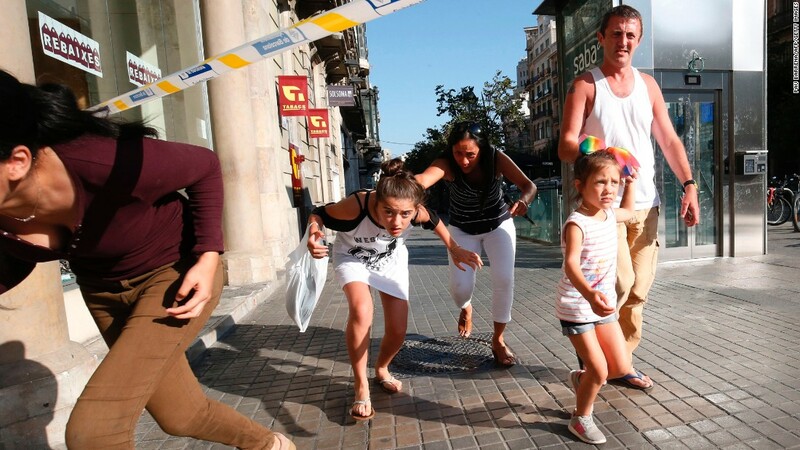 People flee the scene after the attack at Las Ramblas. The Philippine government also said Saturday a 7-year-old boy was missing. He is the son of a 43-year-old Filipino woman who has been living in Australia with her British husband. “She and her son were in Barcelona to attend the wedding of a cousin from the Philippines when the incident happened,” Philippine Foreign Ministry official Sarah Arriola said. Thirty French citizens were wounded in the attacks, the French Foreign Ministry said Saturday. Among the 14 still hospitalized, five were in serious condition. Thirteen Germans were injured and hospitalized, ”some seriously and still fighting for their lives,” Germany Foreign Ministry spokesman Martin Schaefer said Friday. 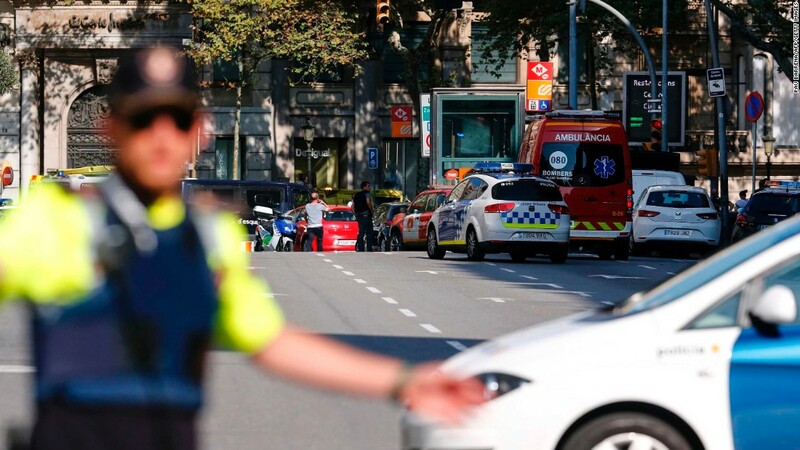 The Turkish Embassy in Madrid said a 33-year-old Turkish man was among those wounded in the Barcelona attack, but his injuries were not thought to be life-threatening, Turkey’s state-run Anadolu news agency reported Friday. The Australian government has said four citizens were hurt — two men have been discharged from the hospital, while one woman was in serious condition and another in serious but stable condition. Four Irish citizens of Filipino descent were injured, said the foreign affairs office in the Philippines, while the Peruvian Consul in Barcelona confirmed one Peruvian also was hurt. 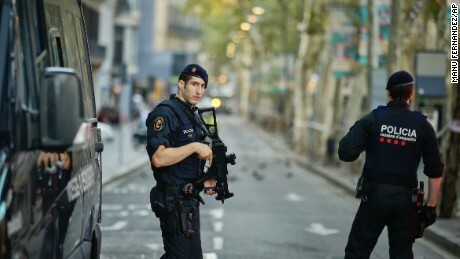 Related Post "American, Canadian, Italians Named As Victims In Barcelona Attack"